This was originally blogged on 27 November 2009. The Dutch national Bicycle Council - Fietsberaad - has reported that this campaign has been a massive success. "83 percent of the approximately 950,000 people who remember the campaign, have been directly affected by it. Within months 26 per cent preferred taking a bicycle or walked for distances of up to 5 kilometres. That means a reduction of 60 million car kilometres, which is 13,650 tonnes of CO2. 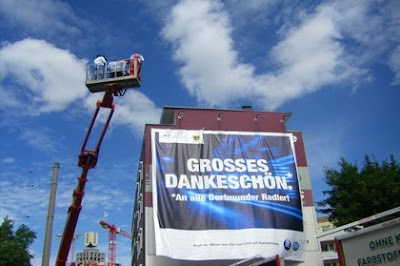 Calculated nationally in Germany it would mean a reduction of 3.8 billion car kilometres , or 1 million tonnes of CO2." - From the Fietsberaad's website. Strange how this one snuck under the Copenhagenize.com radar. It's a national campaign in Germany called Kopf an, Motor aus or I suppose it would be Turn on your brain, turn off your motor in English. 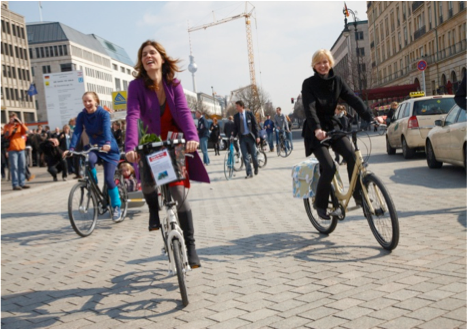 It's funded by the German Federal Ministry of Transport and if campaigns that promote cycling and pedestrians positively get us all hot and bothered and giggly, then consider us all hot and bothered and giggly. It's all about eliminating short trips by car and who can't be thrilled to see a massive poster like the one above in Dortmund reading, "A Big Thank You - to all Dortmund Cyclists." The Kopf an, Motor aus website is only in German but run it through Google Translate for more information. Here's some more bicycle-related photos from the website. The effect of Cycle Chic on bicycle marketing in Europe is not to be underestimated. It really has hit a nerve and is visible even in government brochures in some countries, particularly France. In the above photo from the campaign in Berlin are celebrities Judith Holofernes from the band We Are Heroes, star chef Sarah Wiener and Olympic champion Britta Steffen. By all accounts it seems to be a wonderfully, positive campaign. This focus on reducing the number of short trips by car and transferring them to public transport, foot or bicycle is something we're seeing more and more often in Europe. The Swedish city of Malmö has had great success with a similar campaign. 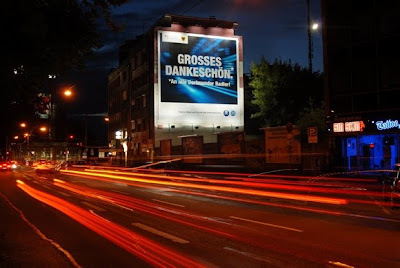 The Kopf an, Motor Aus campaign has a cinema and TV advert which, while nothing revolutionary on a marketing level, is feel goody. I particularly enjoyed the moment when she refused to hug a motorist. 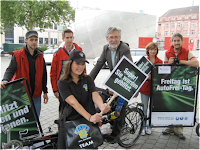 So a frightfully postive cycling/walking/public transport campaign funded by the national government in Germany. Not bad. Not bad at all.